Samsung has announced a wave of new SSDs that double the capacity of its existing and upcoming lines, a move made possible by its third-generation V-NAND. Samsung began mass production of its third generation V-NAND technology last month at the 270 acre fab in Xian, China. Production ramp up is set to begin in Q4 this year. With 48 layers, the technology allows Samsung to squeeze 256Gb onto a single NAND die, compared to 128Gb with the current 32 layer solution (the second generation). 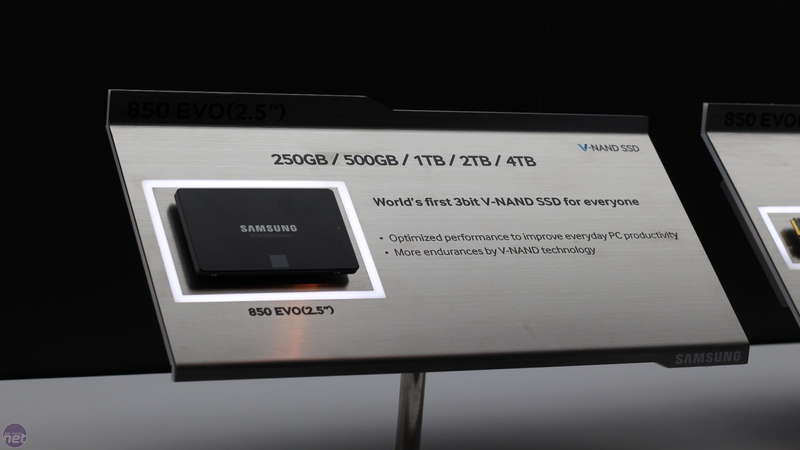 The first products announced were the 4TB versions of the SSD 850 PRO and the SSD 850 EVO. These will retain the standard 2.5in 7mm form factor and operate using the SATA 6Gbps interface. They are due for release in early 2016, which will be less than twelve months after the release of the 2TB editions. Next up is the SSD 850 EVO M.2 1TB. Previously, this was limited to just 500GB. As with the 4TB SSDs, this drive is also scheduled for release in early 2016. Although it had only just finished announcing the 950 PRO SSD at the 2015 Samsung SSD Global Summit, it then went on to confirm that it too will receive a capacity upgrade thanks to the third generation V-NAND. As such, a 1TB 950 PRO SSD will be available at some point, although a more exact release date was not given. It is not only the new capacities that will switch to the third generation V-NAND. Once mass production is achieved, all of the lower capacities make the transition in order to save cost, with Samsung saying it expects performance to stay the same or increase when this happens. Lasltly, you may have noticed that 3D V-NAND is now being referred to simply as V-NAND. This is part of a wider branding strategy that will see the V-NAND branding applied to the packaging and marketing materials of all the relevant consumer Samsung products. Pricing was not confirmed for any of the newly unveiled products. Yes, you read that right: 13TB.